Growing Rhubarb isn't just for the vastly experienced grower, anyone can do it! It does take a bit of patience however as Rhubarb likes to take its sweet time. So in the meantime, you may want to put the kettle on, digest the handy information on this page and prepare yourself for the long haul. 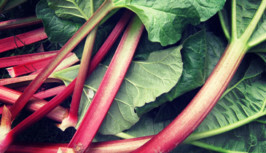 Rhubarb is a native vegetable of Siberia, and it thrives in good old cold, wet British weather. Because of this, West Yorkshire has become a leader in Rhubarb production with its ‘Rhubarb Triangle’. With its hub in the village of Carlton, and Wakefield as its capital city, Yorkshire’s rhubarb triangle covers 23km2. In a similar way to the Champagne region of France, you can only call rhubarb ‘Yorkshire Forced Rhubarb’ if it is grown within this zone and meets specific requirements. This Protected Designation of Origin was awarded in 2010. Yorkshire Rhubarb growers harvest the stems indoor in forcing sheds by candlelight, or more recently using low electric lights. This keeps the stems a bright pink colour and stops them becoming tough. At one stage, West Yorkshire produced 90% of the world’s total winter forced rhubarb. At one stage, West Yorkshire produced 90% of the world’s total winter forced rhubarb. Love a good rhubarb crumble? 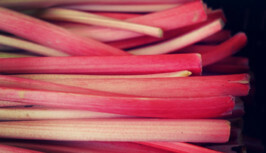 Why not take inspiration from Yorkshire and give growing your own Rhubarb a go? It will look nice whilst growing in your garden, and you can make tasty desserts year after year. Sound good? Follow our handy tips below to get you started. Rhubarb will grow for many years, so give it a permanent, dedicated spot in your garden. It prefers a sunny site with well drained fertile soil. A couple of weeks before planting, mix some organic compost or well rotted manure into the spot where you are going to plant your rhubarb to get it off to a good start as rhubarb plants are quite greedy. Also remove any weeds and stones from the area. Rhubarb can be grown from seed, ‘crowns’ or ‘budded pieces’. Rhubarb crowns are established plants that have already been grown for around one year and these will produce a crop in the first harvest following planting. Budded pieces are smaller pieces of a crown which can be harvest two years after planting. Growing from seed will take a year longer, if you are in no rush then you can give this a go, but we recommend starting from a crown or budded piece to get a head start. The planting time for Rhubarb is usually Spring or Autumn. Once you have chosen your variety just double check on the packet whether it has a preference. Plant the crowns/budded piece around 2.5cm below the soil surface in your prepared area, so that the tip sits just above the soil surface. If you are growing more than one plant, leave at least 75cm between plants as they need quite a lot of space, and leave 30cm between rows. Rhubarb is a nice, low maintenance vegetable to grow, just give it a bit of TLC every now and then and you shouldn’t go far wrong. Spring – During spring remove any flowers that appear, this will allow the plant to use more energy on the stems. Some general purpose fertiliser can be applied to give your plants a helping hand. Summer – Water your plant regularly in dry periods. Autumn – Cut the rhubarb stalks back when the leaves begin to die of. This will expose the buds to the cold winter weather, an important process in growing rhubarb. Autumn is a good time to cover soil surface with a layer of compost. This will act as a mulch to retain water, and add nutrients to the soil ready for the year ahead. Winter – Rhubarb plants can be left during most winters. However every 5-6 years they will need to be divided up to maintain productivity and winter is the best time to do this. Lift the plants out of the soil and use a spade to divide the crown into around 3 separate crowns with a healthy bud on each. These can then be replanted, with plenty of room between them as previously. Rhubarb will be ready to harvest during the second year after planting. Avoid harvesting in the first year and allowing the plant to fully establish during the first year. Rhubarb stems can be harvested from April to June, at which point the stems should be around 30cm long, and they will crop year after year. To harvest the rhubarb, pull the stalk gently at the base and twist it off the crown. Avoid over-cropping by never removing more than half of the stems at a time and this will keep the plant healthy and productive. 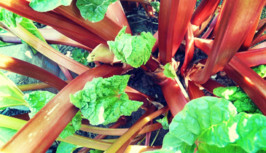 Cut the leaves off the rhubarb stems as these are poisonous if eaten! If you want to speed up your rhubarb crop and have been inspired by Yorkshire’s Rhubarb Triangle then you may want to try ‘forcing’ rhubarb. To do this you need a large pot to cover your plant and stop light getting to it. You can buy specially designed pots, or a large bucket/bin would do the trick. Cover the rhubarb with some straw and cover it with the pot in January. The rhubarb will then be ready to harvest eight weeks later. You should now have everything you need to get your rhubarb plant going and have your very own supply of rhubarb every spring for years to come! All that’s left is to get baking!